A TURKEY CHILI RECIPE WITH FARM FRESH VEGGIES! 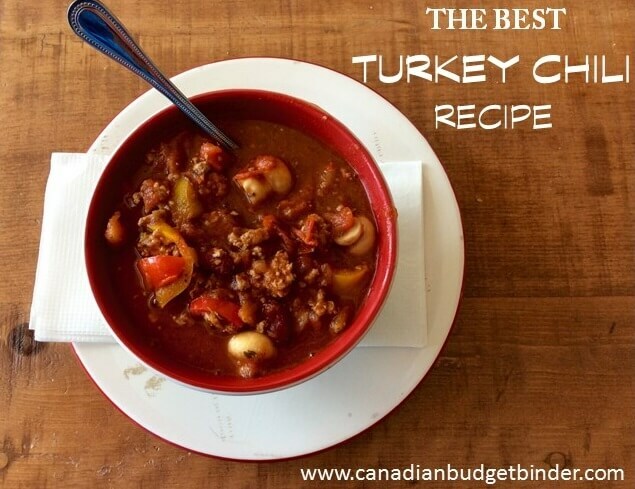 Time is not on everyone’s side but if you meal plan you can make recipes like this gorgeous Turkey Chili Recipe that CBB fan Chandra has submitted to share with all of you. These days it seems easier to just buy canned and frozen food instead of spending the time chopping up vegetables for delicious, healthy recipes. I’ve tried some award-winning chili recipes in my time with beef but never have I made a turkey chili before. I was intrigued when Chandra shared this on my Facebook page in our What’s For Dinner? nightly post. Using the same proteins for recipes can get boring plus it’s nice to add leaner cuts of meat or minces like turkey to recipes to make them healthier. Mrs. CBB and I have always enjoyed turkey meals made from mince such as turkey burgers or turkey pot pie. Either way kicking beef to the curb for a day or so is not a bad thing if you want to experience new flavours. You may even find turkey to be cheaper to buy rather than beef mince. If you don’t mind cooking a whole turkey you can save even more money. My daughter and I decided we needed to add more healthy food ideas into our daily life. Over the last couple of years my body has decided it can’t handle anything that is processed, MSG or GMO foods. There are only a few restaurants that I can eat at which keep everything natural, without suffering 20 minutes later. What does GMO stand for? Good Question…GMO simply means Genetically Modified Organism. We like chili and we didn’t want to use sauces from cans, or spices that were pre-packaged because of the MSG and sodium. You can modify the ingredients in this recipe for a smaller batch of turkey chili. Additionally I used mostly farmers market veggies which are a bit more pricey, but far more flavour. This homemade chili recipe from scratch is for a big batch of turkey chili, so I hope you’re hungry! If you love chili and like to try different proteins check out this amazingly flavourful GMO and MSG free turkey chili for your next meal. 2 packages of ground turkey 2lbs or so. In food processor core and add the 3 tomatoes, throw in jalapeno, onion and garlic mix together. Simmer cherry tomato halves first until juices appear, add all veggies, and kidney beans, brown turkey and add to the pot. Mix spices in small bowl and slowly add to chili. Taste as you go so you don't over use the spices. Add salt and pepper to taste. Simmer until cooked I cook mine until the vegetables still have a slight crunch. Up to 1 hr. I had enough turkey chili to freeze two medium-sized containers and have another meal to feed 3 adults. This turkey chili recipe easily could feed 8-10 people. It would be perfect if you are having a large gathering and don’t want to spend all your time in the kitchen. I hope you try and like it. I am not a fan of Turkey food. But, this time I think I will be one. This Turkey chili dish looks so appetizing and have so many spices. I have to taste this one of these days. This one looks very delicious! I should try this one tomorrow! This sounds very interesting!!! Hubby loves the really spicey food but the boys and I might tone it down a little. I would think you could do this in a slow cooker as well, on low for a few hours if you were out of the house…. Might be good with ground chicken too. Chili is one of those recipes that are so fudge-able!!!! Thanks so much Chandra!!! I’m not big on spicy but I like a little heat.